Beach Area Pizza/Pasta/Sandwich/Salads - SBA Loan Avail. - Low Rent! SBA LOAN WITH 20% DOWN AVAILABLE! ANNUAL LOAN PAYMENTS ARE $48,000. AFTER DEBT CASH FLOW $141,000! Located blocks from the beach and next to one of Ventura's great redevelopment areas and best neighborhood, this cool and hop pizza and Italian business has served-up great food and service for 15 years. 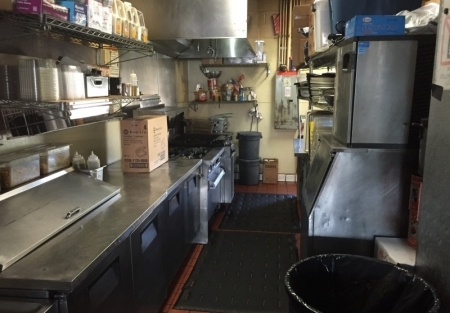 From pastas, pizza, salads and sandwiches, this restaurant is known as a local hole-in-the-wall place with low rent and lots of traffic in the center. YES LOW RENT! 4.9% rent factor! SEE VIDEO FOR OWNER INTERVIEW! LOOK TO THE LEFT. OR GO TO SellingRestaurants.com. For all practical purposes, this business is absentee operated as the owner lives in Huntington Beach and visits the store a couple times a week. In fact his travel schedule is extensive and you'll rarely find him at the store. So please don't talk to any of the employees should you visit the restaurant. The employees are well trained, with many of them working for the restaurant for many, many years . It can be continued to be absentee operated. The Seller's Discretionary Cash Flow is $189,000!!! This restaurant has a system in place that allows the owner to be absent form the business. He has full security camera's as well and good checks and balances in place with loyal employees. There are two hood systems - a type I and type II. There is also a walk-in doubling as a soft drink reach-in. There is beer and wine served as well. The facility is 1,200 Sq. Ft. with a low, low rent of only about $3,200 a month! That's about 4.6% of sales! GROW BUSINESS: There are hundreds of expensive homes a block away from this restaurant. Re-start the delivery service and watch the business grow. Please View our Video at www.sellingrestaurants.com and search for listing 4913.